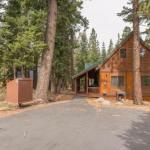 Talvensaari is situated in Donner Pines Tract and offers a tennis court. It features free WiFi and a restaurant. Leading onto a terrace with mountain views the holiday home consists of 1 bedroom and a fully equipped kitchen. The holiday home also offers a bathroom with a bath or shower. Reno is 42 km from Talvensaari. Reno-Tahoe International Airport is 44 km away.